11 G R O W I N G TO G E T H E R WWW.BKT-TIRES.COM Todd Holub, OTR Sales Manager, A&E Tire Inc. "BKT has been very easy to work with. We have made great strides to form a solid business relationship between manufacturer and dealer. What we came to discover is the BKT tires provided us a competitively priced tire that was high quality as well. Also, BKT has been very aggressive in building new radial and bias OTR products. I would recommend BKT to anyone looking for a quality OTR tire at a fair cost that is also professionally represented by quality people." 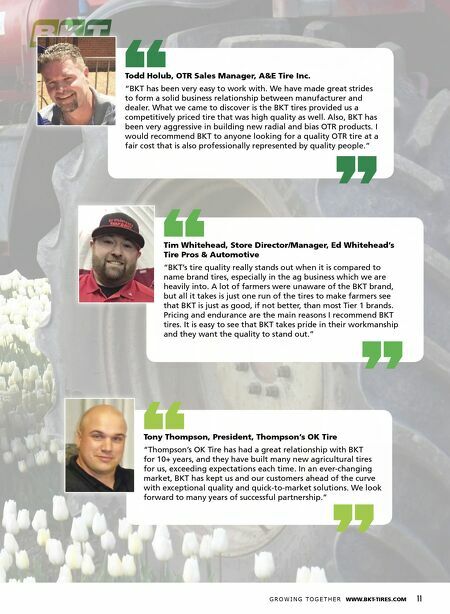 Tim Whitehead, Store Director/Manager, Ed Whitehead's Tire Pros & Automotive "BKT's tire quality really stands out when it is compared to name brand tires, especially in the ag business which we are heavily into. 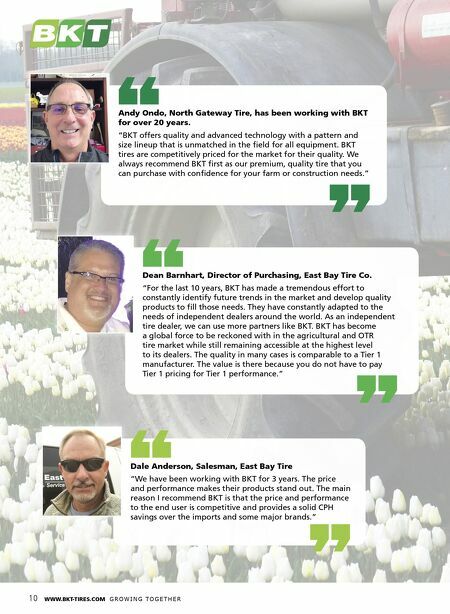 A lot of farmers were unaware of the BKT brand, but all it takes is just one run of the tires to make farmers see that BKT is just as good, if not better, than most Tier 1 brands. Pricing and endurance are the main reasons I recommend BKT tires. It is easy to see that BKT takes pride in their workmanship and they want the quality to stand out." Tony Thompson, President, Thompson's OK Tire "Thompson's OK Tire has had a great relationship with BKT for 10+ years, and they have built many new agricultural tires for us, exceeding expectations each time. In an ever-changing market, BKT has kept us and our customers ahead of the curve with exceptional quality and quick-to-market solutions. We look forward to many years of successful partnership."